WHEN IT COMES to overall destruction, Hurricane Iniki's 1992 direct hit on Kauai remains the high-water mark for weather-related calamity in Hawaii. But the recent torrential rain and the chaos it spawned outdid Iniki in the statistic that matters most. 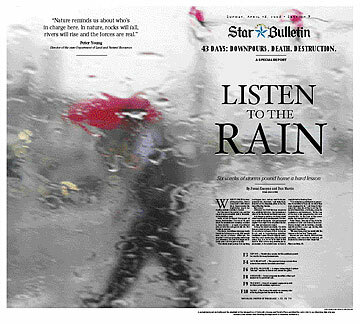 Listen to the Rain has been provided for our online readers in Adobe PDF format as the layouts were too complex to reproduce reliably online. Free Adobe Reader is required to view the special section, downloadable here. F3 Coping | Floodwaters recede, but the problems persist for months for many homeowners. F4 Environment | The greatest damage occurs when nature's force meets man-made structures. F7 March madness | A unique meteorological system "blocked" weather in Hawaii and around the globe. F8 Business | Some companies benefited, others got soaked in the persistent rain. F9 Tourism | Hawaii's economic engine deals with multiple public-relations nightmares. F10 Kauai | The Garden Isle works on recovery after suffering the greatest losses in the state. Iniki, which flattened thousands of homes, took six lives. The rain of '06, as it might be remembered someday, resulted in seven deaths -- or eight, if an ill-fated plunge into the sewage-fouled Ala Wai Harbor is counted. 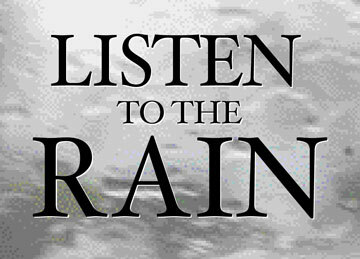 The lesson from those six soggy weeks from late February to early this month now seems obvious: Although the dreaded hurricane generates more hype and awareness, the rain that keeps our islands green can turn just as deadly. "The whole event proves that anything can happen here, and we need to be prepared for the abnormal," said Andy Nash, director of the Honolulu office of the National Weather Service. Although the Civil Defense response was relatively hitch-free, few homeowners affected by the floods had flood insurance. "Nature reminds us about who's in charge here. In nature, rocks will fall, rivers will rise and the forces are real." And deeper questions are being raised about ham-handed development, interference with watersheds, and government neglect that might have magnified the human loss and economic impact. Among the worst examples, the state has no record of ever inspecting Ka Loko Dam, whose collapse killed seven on Kauai, and is investigating whether landowner James Pflueger illegally modified the area's landscape. The decrepit sewer line that burst in Waikiki dated back to 1964 and was long overdue for replacement. A stream diversion in Hauula contributed to flooding there. "The underlying problem was government's inability to basically do what they were supposed to do," said Dean Uchida, executive director of the Land Use Research Foundation, a lobbying group for landowners and developers. "In the case of the dam safety program, the state was responsible. In the case of the sewer mains, that was just total neglect." Peter Young, director of the state Department of Land and Natural Resources, blames budget cuts for deleting a dam inspector position a year ago, leaving him with just 1 1/2 positions. "We were doing what we could with the resources that we had," Young said. Moves are now afoot to add back two positions, and since the dam break, all dams in the state have been inspected.